a way to spring into… well, spring. 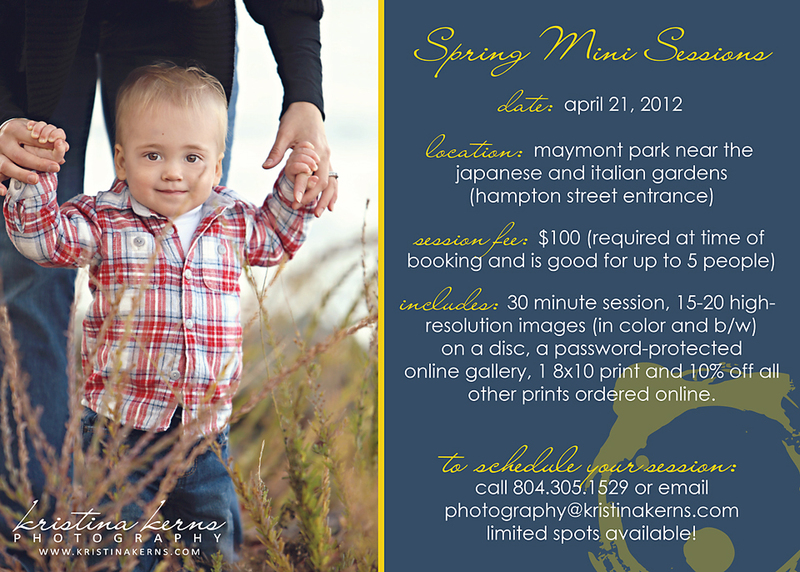 Spring is right around the corner and now is the perfect time to capture your family on camera with the new Spring Mini Sessions. Mini sessions are a GREAT alternative to a full session if your family is crunched for time or if you have a little one that has a shorter attention span. 😉 I’ll be taking photos all day on April 21, 2012 at Maymont Park. If you haven’t already seen the popular video by Jefferson Bethke, go do it now. It’s seriously one of the best videos I’ve seen in a long time. And if you follow me on Twitter or if we’re friends on facebook, then you already know I posted in both of those places. I debated whether to even post the video here on my blog since I’ve already emailed it a million times and spread it through social media.. but the more I thought about it.. the more I realized that I didn’t want anyone to miss out on seeing this video. And if you’re anything like me.. you’ll need to watch it more than once. It’s A LOT to take in when you only view it once. So. go. enjoy. and let the words that come from his mouth resonate in your heart. One of the biggest problems I have in life.. is thinking something is God’s calling when it really stems from my own desires. Little or big.. I would think to myself.. Yes, God wants me to do this. But then, I would go to Him seeking His blessings. So.. in all actuality- I wanted to do it and then I wanted God to bless it. And probably an even bigger issue I have is seeking happiness in all of the wrong places. I seek fulfillment in my job and in the success I have or hope to have one day. I seek happiness in buying designer clothes and handbags and shoes. I seek satisfaction in things. Lots of things. “If only I had…fill in the blank…” I seek contentment by the approval of other people – at church, at work, within my own group of friends… I seek true happiness in all of the wrong places. Deep down, I know that true happiness comes from Jesus. As Christians, I’m fairly certain we all “know” that. But.. the question is.. do we really know that.. do we really understand that.. do we really believe that? Well, it’s time we start believing..
No matter how “full” our lives may be.. they really are pretty empty. When we set out to find happiness in our jobs, we come to a dead end. 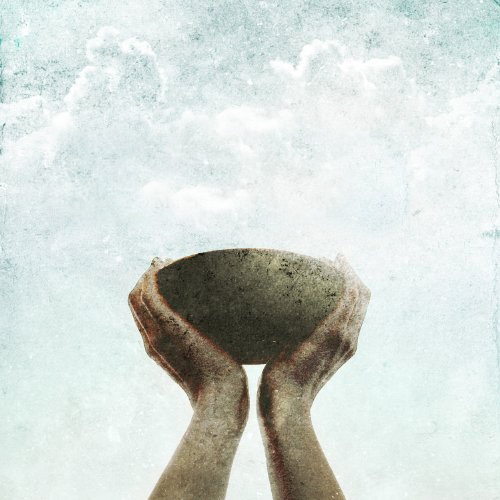 When we set out to find fulfillment in material possessions, we come home empty handed. When we seek anything that doesn’t bring us closer to the Lord, we always end up disappointed. It isn’t until we have Jesus truly living in us that we have complete happiness. He is our source.. He is our living water. And anything else… is just well water. Jesus is not the blesser of our plans.. He is the Author and when let Him write our story, our lives will overflow with joy. When we come to Him with open arms and drop the reins of control.. totaling surrendering to His will and leaving it all behind- we won’t thirst any longer for the things of the world. We’ll find what our soul has always longed for.. and we’ll be truly satisfied. Jesus offers us all we need. It’s up to us to come to the Well of the Living Water. The more time we take to drink him in and allow Him to change our hearts, the more we let go of everything else and allow Him to be our Well. Let’s stop drinking well water and seeking happiness in the things of this world, instead.. let’s come together to the Well of the Living Water.. where eternal joy can be found. note: artwork in the post comes from the casting crowns album cover.